$225.00 Brass Framed Hand Tinted Photographic Stalin Badge,C 1930s. $95.00 Photograph of Stalin in a Miniature Chromed Screwback Frame, C 1930s. $90.00 Screwback Lapel Pin with Stalin's portrait printed on a small mirror, C 1920s/1930s. 17.6mm in diameter. $160.00 Photograph of Stalin in a brass and celluloid brooch, circa 1930s, 41.2 x 30.9mm. $85.00 Polish-made "Generalissimo Stalin" Lapel Pin, C late 1940s. $145.00 "Shock Worker" 1939 Award Badge, Stalin's portrait on red enameled "rosette". In very fine condition. $180.00 All-Union Society of the Friends of Museums of the Revolution, membership badge, mid to late 1930s. In excellent condition, with perfectly preserved enamel. $95.00 Screwback Lapel Pin with Lenin's and Stalin's profiles printed on a small mirror. $90.00 Pinback Lapel Pin with Lenin's and Stalin's idealized profiles dramatically printed in gold on a chrome-framed black celluloid surface. Circa 1930s. $125.00 Lapel Pin with bas-relief profiles of Lenin and Stalin, C 1930s-1940s. $45.00 30th Anniversary of the October Revolution, commemorative badge, issued in Soviet Estonia in 1947. A less common PIN BACK Version, with maker's mark to the reverse. In very fine to excellent condition. $70.00 30th Anniversary of the October Revolution, sturdy and attractive 31.6mm pin back commemorative badge, 1947. $75.00 30th Anniversary of the October Revolution badge, 1947. $120.00 Lenin Mourning badge, 1924 issue. Very fine to excellent condition. $115.00 Silhoutte of Lenin in a Miniature Chromed Screwback Frame, C 1930s. $60.00 Portrait of Lenin in a Miniature gilded pinback Frame, C 1950s-1960s. $45.00 Two-piece Lenin's Birth Centenary Commemorative Badge. $60.00 Lenin's Centenary, commemorative badge in silver and enamels, hallmarked, 1970 issue. Shows red carnation, a symbol of Bolshevik revolution. In excellent condition and very well made. $60.00 Lenin on Top of an Armored Car, Centenary commemoration badge in hallmarked silver and enamel, 1970. Excellent condition. $55.00 Lenin's Centenary, hallmarked silver & enamel commemorative lapel pin, 1970. Top quality and in excellent condition. $60.00 Lenin's Hut in Razliv, commemorative pin in silver, 1970. One of the less common badges of the "VIP" Lenin Centenary series. 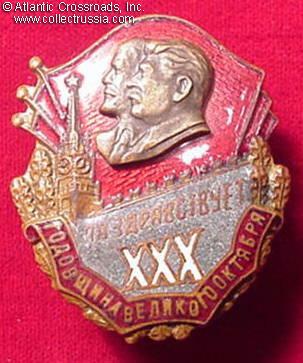 $50.00 Official 30th Anniversary of Komsomol badge, 1949. $380.00 Sergey Kirov Mourning / Commemorative Badge, circa 1934-35. $105.00 Screwback Lapel Pin with portrait of Marshal Kliment Voroshilov printed on a small mirror, C 1935 or later. 20mm in diameter. $110.00 Screwback celluloid and plated brass Lapel Pin with Vyacheslav Molotov's printed photographic portrait, C mid to late 1930s. 17.3 mm in diameter.